So, you want to be a millionaire? You dream of leaving your job, of being your own boss, and living the millionaire lifestyle that you see on TV. You know that's what you want, but there's one small problem, you don't know how to attain it. Here's the thing: everything starts and ends with your mindset--it's the determination of that mind that drives you to make your dream a reality. If you're thinking and operating on the mindset of a poor or middle-class person, you will produce the end results of that mindset. Your attitude and actions reflect your mindset. "The success secrets of the ancients--an assured road to happiness and prosperity." "An unabridged edition to include the text from both the audio and subsequent video version of Earl Nightingale's 'The Strangest Secret,' considered one of the greatest motivational works ever compiled." "It was the first book to boldly ask, "What makes a winner?" The man who asked and listened for the answer, Napoleon Hill, is now counted in the top ranks of the world's winners himself. The most famous of all teachers of success spent "a fortune and the better part of a lifetime of effort" to produce the "Law of Success" philosophy that forms the basis of his books and that is so powerfully summarized in this one." "A fresh, modern look at the core theme of Napoleon Hill's revolutionary best seller. In this inspiring contemporary fable, a young writer sets out to interview business leaders and other influential figures about the importance of persistence in attaining your goals. Through motivational real-life stories, Three Feet from Gold offers advice about having passion for what you do, finding your own Success Formula, choosing good counsel, and above all: never giving up." "Robert Kiyosaki shares the story of his two dads: his real father, whom he calls his ‘poor dad,’ and the father of his best friend, the man who became his mentor and his ‘rich dad.’ One man was well educated and an employee all his life, the other’s education was “street smarts” over traditional classroom education and he took the path of entrepreneurship…a road that led him to become one of the wealthiest men in Hawaii. Robert’s poor dad struggled financially all his life, and these two dads—these very different points of view of money, investing, and employment—shaped Robert’s thinking about money." 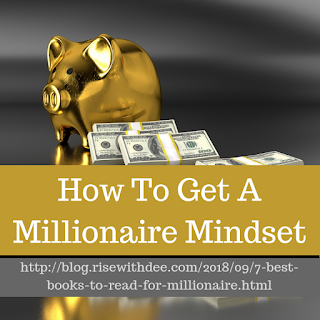 "In his groundbreaking Secrets of the Millionaire Mind, T. Harv Eker states: "Give me five minutes, and I can predict your financial future for the rest of your life!" Eker does this by identifying your "money and success blueprint." We all have a personal money blueprint ingrained in our subconscious minds, and it is this blueprint, more than anything, that will determine our financial lives. You can know everything about marketing, sales, negotiations, stocks, real estate, and the world of finance, but if your money blueprint is not set for a high level of success, you will never have a lot of money—and if somehow you do, you will most likely lose it! The good news is that now you can actually reset your money blueprint to create natural and automatic success." "The future belongs to a different kind of person with a different kind of mind: artists, inventors, storytellers-creative and holistic "right-brain" thinkers whose abilities mark the fault line between who gets ahead and who doesn't." "Drawing on research from around the world, Pink outlines the six fundamentally human abilities that are absolute essentials for professional success and personal fulfillment--and reveals how to master them. A Whole New Mind takes readers to a daring new place, and a provocative and necessary new way of thinking about a future that's already here." That's all I have for you today. Happy Reading!